Question: Why do acts/artists go down the re-recording route as well as getting the sudden need or urge to re-visit their past? Answer: Simply just to get back the control of their songs and hopefully make some money in the process. Then again. Their old record company could simply just re-release the original recording and people would still buy them in ship loads (since we all prefer originals). In my humble opinion, this is more or less a case of 'damned if you do, damned if you don't'. 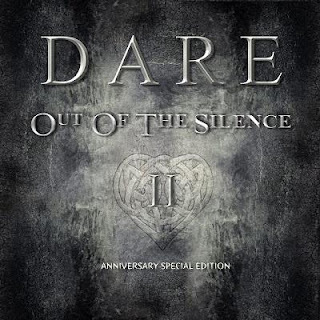 Dare is probably best known for their singer/songwriter Darren Wharton, who first rose to fame in the early eighties playing keyboards with legendary Irish rock band, Thin Lizzy. 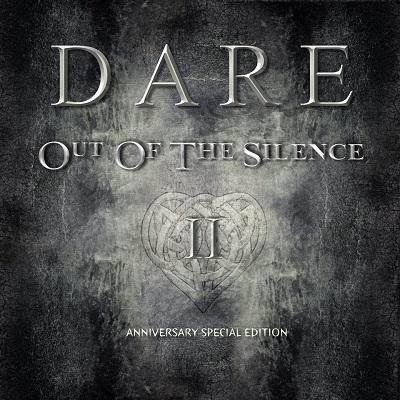 The band's superb debut 1988 A&M album "Out Of The Silence", recorded at Joni Mitchell's Bel Air Studio in Los Angeles and produced by Nickelback producer Mike Stone has now been re-recorded as Out of The Silence II. Having gained cult status among AOR fans throughout Europe while touring with Europe (the band - not the continent), the UK act has sadly never managed to reach the wonderful heights of the classic debut. Nearly each track draws in the listener, they hang on to each and every word, each hook. In fact. Every household should have at least two copies. With this release nothing has been added to the re-recordings. Nothing extra, no bonus. They're not going to make much money from old recordings and probably the same with this. They should just get back into the studio and record a brand new album. Preferably somthing that rocks and doesn't make you fall a sleep halfway though (hint-wink). Me thinks the band should do what others (sorta') did in the past and put a disclaimer sticker on their product saying, "This album in no way endorse a disbelief in being bloody pointless". Because that's the album in one word if you're a long time fan - pointless. The original record sound better, the band was DARE I say young and hungry, and you can't ignore the eighties styled production and sound. For the record, I don't dislike or have a grudge with any past or present members of DARE. Quite the opposite. I really like the 1988 album. It's always originals over re-recordings and that goes for all musicians out there. Even if we understand the logic behind these records.